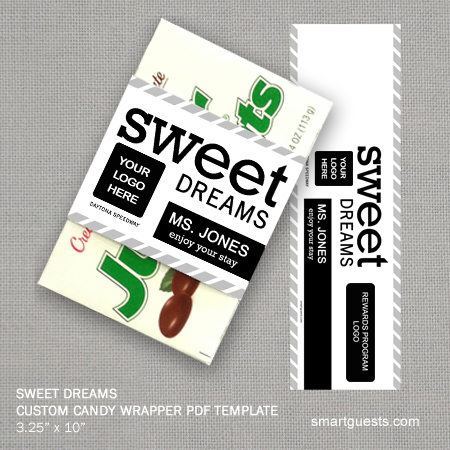 Surprise guests while improving your service scores with our Sweet Dreams Custom Candy Wrapper. Show loyalty rewards members how much you appreciate their business by handing this unique tool at check in. This highly engaging yet simple tool will have your customers posting positive reviews on popular site such as TripAdvisor and Facebook. It's fast and easy to implement at any hotel. Follow the quick how-to below and jumpstart your way to creating a sweeter hotel experience for your guests. If you have any questions or special requests for your order, please email us. Customizations include hotel's logo, name/location and loyalty program.